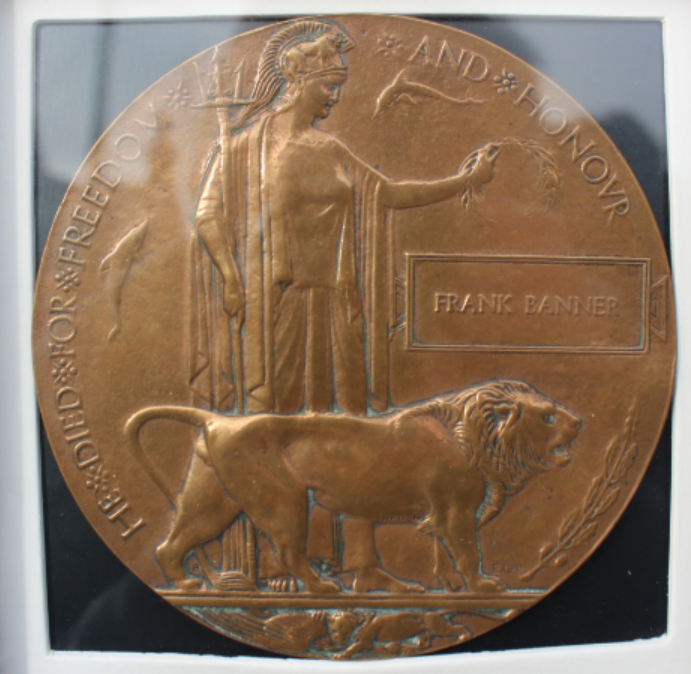 Frank Banner, the son of a gardener, was born in late 1889, the ninth child of Edwin and Ann Elizabeth Banner*. 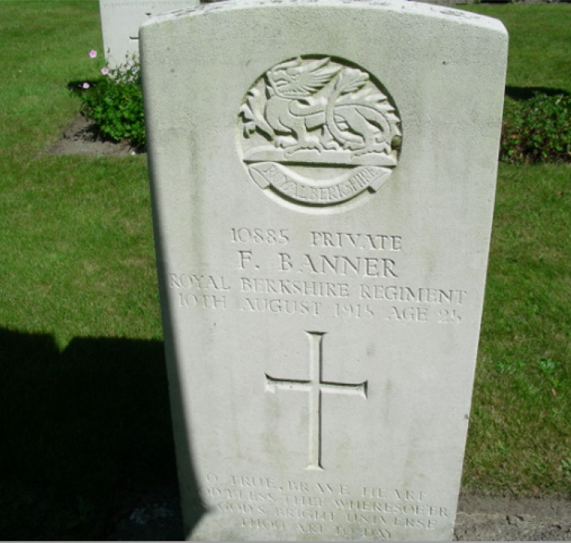 His father, Edwin Banner was born c1848, in Leigh, Worcestershire. His mother, Anne Elizabeth Holland, was born c1853 in Hertfordshire. The couple married in 1876 and had at least 11 children between 1873 and 1896. The first six children were born in Worcestershire (Sarah 1873; Jane 1874; William 1877, Frederick 1880, Emily 1881, and Walter 1882). Lily was born in 1885 in Reading, Berkshire, and four more children were born in Spelsbury, Oxfordshire (George 1887; Frank 1890; Alfred 1892; and Edward 1896). 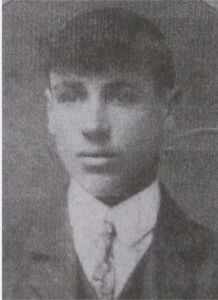 Frank’s mother, Ann, died in 1897, aged 45, when Frank was just eight years old. At the time of the 1901 census, the family was still in Spelsbury, living next to All Saints Church. Most of the older children had left home. Walter was working as an under-gardener, possibly alongside his father, and Emily was listed as the housekeeper, no doubt helping her widowed father to look after the younger children, George, Frank, Alfred and Edward. Like Frank, Florence, or ‘Florie’, was from a large family. She was one of at least 12 children born to Walter and Mary Moore. She was born at Combe, in Oxfordshire, where, according to her descendant Keith Moore, her family was working at Blenheim Palace. 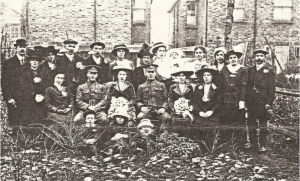 By 1901 she and her family were living in Datchet at Kinross Cottages on Slough Road. This suggests that her father, Walter, a carter, was working for ‘Jock’ Kinross, the self-styled ‘squire’ of the village, at Riding Court Farm. Florie’s father, Walter, died in early 1911, age 60, and on the night of the 1911 census, his widow, Mary, was at Albany Road, Old Windsor, with children Walter and Maude. Florie, by then 19, was working as a maid with the Gibbons family at 1 North Villas, New Road, Windsor. 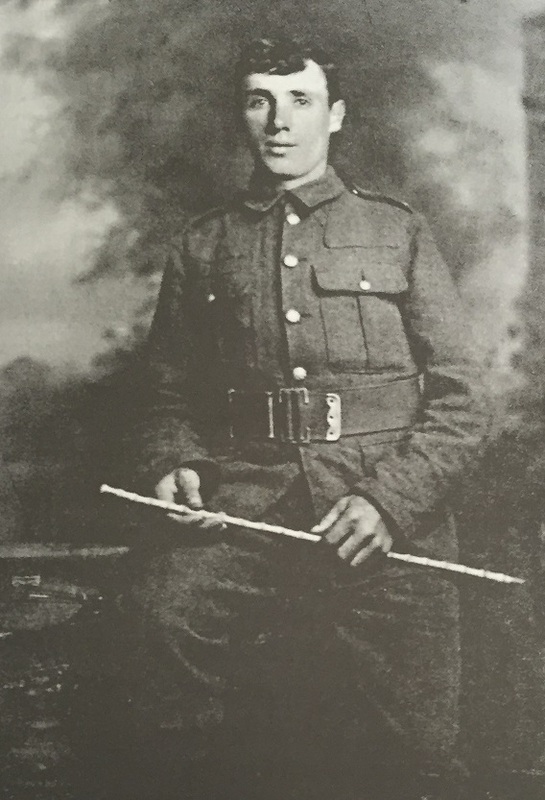 Frank had enlisted in Reading, becoming Private 10885 in D Company, 2nd/5th Battalion of Princess Charlotte of Wales’s Royal Berkshire Regiment. He landed in France on 30 May 1915. 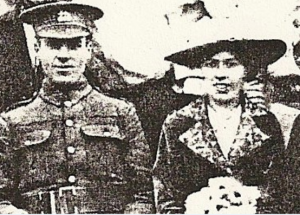 His brother-in-law William Blay also joined the same Battalion as Private 10878. 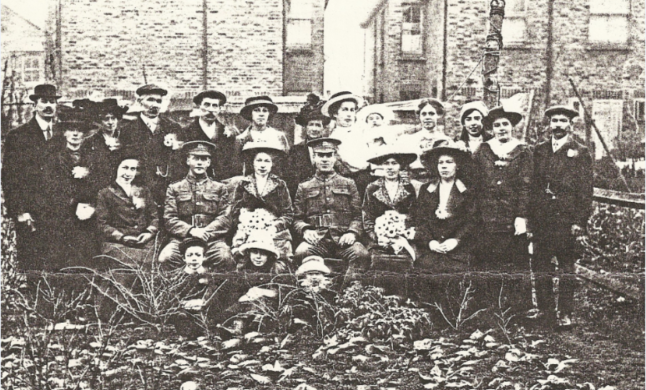 The 5th (Service) Battalion was raised at Reading in August 1914. The troops trained at Shorncliffe, Folkestone and Malplaquet Barracks at Aldershot. They went to France at the end of May and served with 35th Brigade in 12th (Eastern) Division on the Western Front. In June 1915, they took over a section of the front line at Ploegsteert Wood. By mid-July the Divisional front had extended south, reaching to the east of Armentieres; and the 12th Division was holding 7000 yards of the front line. Even in this relatively quiet sector, in July 1915 the Division lost seven officers and 64 men, with another 18 officers and 413 men wounded. Frank was buried at Rifle House Cemetery, Comines-Warneton, Hainaut, Belgium. 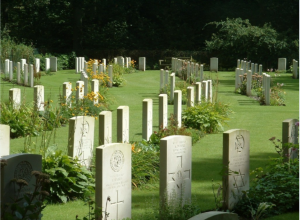 The cemetery lies in the wood at Ploegsteert and the only access is on foot, via a track. Frank’s grave is plot 4 on row D. His headstone reads: “O true, brave heart, God bless thee wheresoe’er in God’s bright universe thou art to-day”. Frank is also remembered at Old Windsor Memorial Hall and on the War Memorial on Datchet’s village green. He was awarded the Victory and British medals and 15 Star, and his family received a memorial plaque, pictured below right. Frank left Florie £102 18s in his will, (see probate record, left, from December 1915). This was probably equivalent to around £4800 today. The address, Laburnum Cottage, Albany Road, was Florie’s mother’s address so it’s likely she was living with her mother after Frank’s death. Sadly Frank died before he could meet his newborn son. Frank W Banner was born in early 1916. 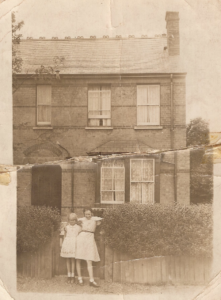 Sometime around 1920, Florie and young Frank moved to Kingsley, 67 Slough Road. This was not far from where Kinross Cottages had stood, where Florie had lived as a young girl. At the moment, it is something of a mystery how a former housemaid, a widowed young mother, could afford to live there. Florie eventually moved to Oxford Road in Windsor. 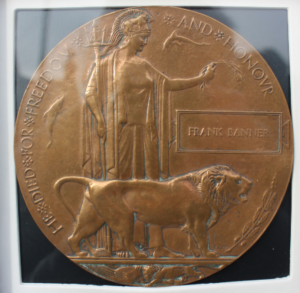 When she died, her niece, Marjorie, took care of her estate and Frank’s memorial plaque or ‘dead man’s penny’ was passed down to her son. 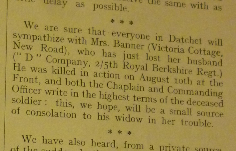 Florence, her sister, brother-in law, and other members of the Banner, Moore and Blay families are buried at the Parish Church of St Peter and St Andrew in Old Windsor. With many thanks to Derek Metcalfe and Keith Moore for kindly allowing us to use family photographs and for providing additional information. *The Commonwealth War Graves Commission lists Frank’s mother as ‘Mary’ Banner, the census and marriage records list her as Ann.